A contemporary pair of Claddagh stud earrings made from sterling silver. These beautiful Irish earrings feature the Claddagh emblem with five round white Swarovski® crystals in each jacket which sit comfortably under the earlobe giving these earrings an effortless and contemporary touch. The earrings are made up of a Claddagh stud earring to the front with the Swarovski® Crystal jackets attached to the back of the earring. These beautiful Irish earrings are the perfect addition to your jewellery collection. They have an elegant and simple design that allows for day to night wear. 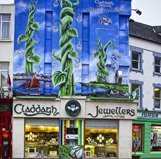 Claddagh Jewellers- The Celtic Jewellery Specialists - From Galway with Love!